When it comes to RV campgrounds, electricity is the gold standard. Lots of places have water – you don’t use much anyway – and dump stations are not that hard to find. But you’re gonna pay to charge your batteries and run your heat pump/AC, usually over $15 a night, even with seniors discounts. 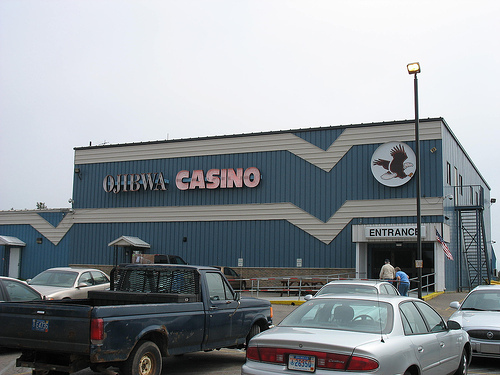 You will pay, except for at this one place outside Marquette, Michigan, The Ojibwa Casino. Kat reads all the full-timer blogs, and the authors of one called The Road of Retirement are in Michigan, going east to west while we’re moving in the other direction. Road found this place and wrote about it, so we had to go there. It is better than billed. The basic deal is you are paid $5 a night to camp there in your trailer or RV, plus $5 to sign up for their frequent loser card, plus $5 to give them a valid e-mail address, plus two $5 vouchers that double your blackjack bet’s payoff, and a ticket for a Killian’s draft beer on the house. And then they give your spouse the exact same deal. That’s just Day One, and you’re already up $45 cash, plus the doublers! On Day Two, and all days thereafter, they give you each $5, a free draft ticket, and two $5 blackjack bet doublers. They don’t have a dump station, but hey, I could spend a month here, because it’s a fun place with no limit to how long you can stay. The guy next door took out his weedeater while we were there and cleaned up his lot. He’d been in Ojibwa since early June. 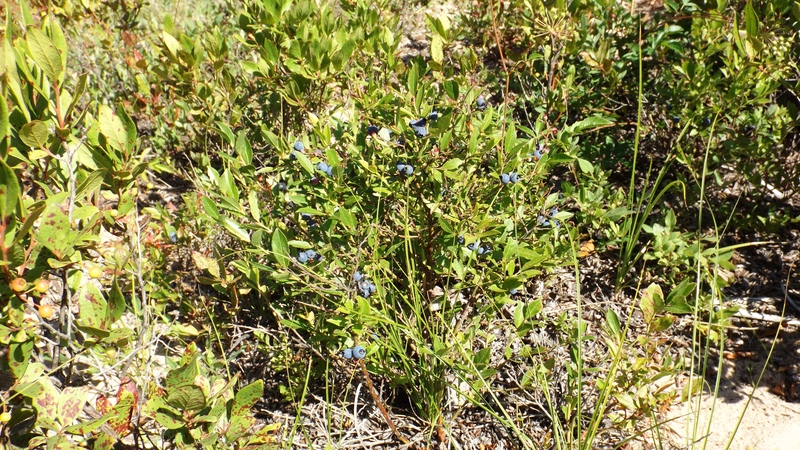 And there’s the wild blueberries that grow anywhere in the Upper Peninsula with full sun where nobody mows the lawn. Kat picked nearly a gallon over three days. She kicked the habit only when we ran out of freezer space. We’ve used them in pancakes, muffins, syrup, yogurt, and are looking for fresh salmon to grill with a blueberry sauce. There are so many berries neither the natives nor the birds mind outsiders picking. Absolutely amazing! We gambled our gift money. Seemed right to expose it all to the blackjack table, and thanks to luck, internet practice, and mostly to the four daily doublers, we won something like $60, net, over three days. True, I quit after winning all four doublers one night, but later we gambled on after losing on consecutive hands holding 20, 19, and 20: no pikers here.